Perhaps because of recent rising tensions between the world’s superpowers, we’ve been treated to quite a few spy films in 2015 – six to be exact. KINGSMAN: THE SECRET SERVICE was a cheeky and utterly bombastic look at the genre. SPY transformed into something greater than a “spoof.” MISSION: IMPOSSIBLE – ROGUE NATION was an intelligent thriller driven by spectacular stunt sequences. And Guy Ritchie’s highly-stylized THE MAN FROM U.N.C.L.E. was like mainlining 60’s European glamour. 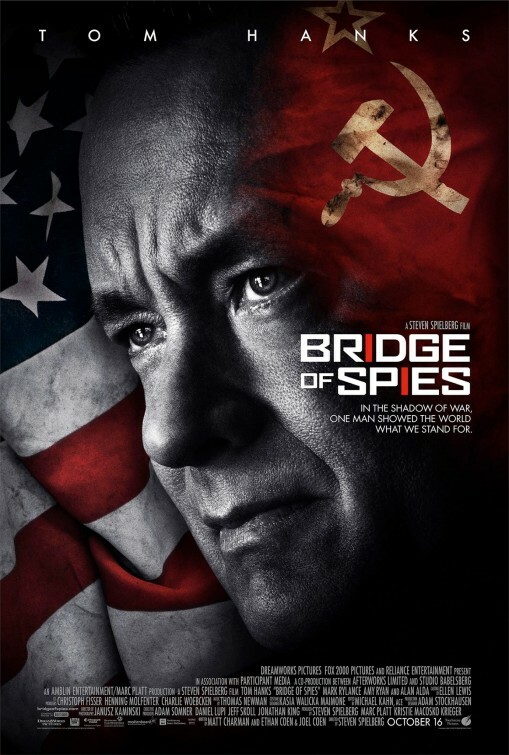 While we still have SPECTRE to look forward to, director Steven Spielberg plunges us into a world of intrigue and espionage with BRIDGE OF SPIES. The picture takes a decidedly different path than the aforementioned films (and what the marketing campaign would have you believe), opting for quiet conversation over action-packed stunts. Based on a true story, the film doesn’t quite do its real-life badass hero justice, but there are a few remarkable things to come out of it. It’s 1957, at the height of the Cold War and everyone is paranoid about the nuclear age. Brooklyn-based insurance lawyer Mr. America Apple Pie, Esq. James. B. Donovan (Tom Hanks) is asked by his boss (Alan Alda) and the United States government to represent Rudolf Abel (Mark Rylance), an alleged Soviet spy who’s recently been jailed in the U.S. There’s a lot riding on this for all parties: the U.S. needs to look like the good guys in the eyes of the world by giving this man the right to independent counsel. It’s good for the firm. Despite his wife (Amy Ryan) and children’s objections and being reviled publicly, Donovan feels it’s his patriotic duty to defend his mild-mannered client’s rights. All that should be enough drama for one movie, but the second chapter (which practically plays like a second movie that’s been spliced to the first) is where our hero’s problems deepen. Things don’t really get interesting until Lt. Francis Gary Powers (Austin Stowell) is imprisoned and interrogated by the Russians, and American student Frederic Pryor (Will Rogers) gets trapped behind enemy lines in East Berlin. It’s here where Donovan’s skills are put to the test in high-stakes negotiations. 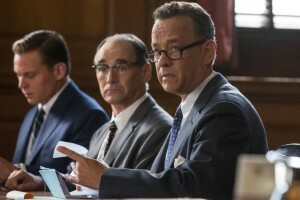 Mark Rylance and Tom Hanks star in BRIDGE OF SPIES. Courtesy of Dreamworks Pictures. Most of the magic of this film – a film your dad is destined to love (or in my case, fall asleep to) – is found within the performances. In almost hallmarked fashion, Hanks plays it safe (when have his roles ever been ballsy?! ), but seeing him do so in the environment Spielberg has created is amusing. While not all of their ventures have been successful, there’s a reason they’ve worked together three times before. Especially in the film’s delightfully disjointed second half, Hanks balances the humor, pathos and ludicrous nature of his character’s conundrums and translates it into mesmerizing entertainment. Sparks also ignite in Hanks’ scenes with Sebastian Koch, who plays Wolfgang Vogel, the German lawyer with whom Donovan negotiates. However, it’s Rylance who hijacks the entire film. I would watch the sh*t out of a prequel starring Col. Abel. Infusing his character with an endearing warmth, laconic ease, laid-back temperament and even a terminal case of the sniffles gives him depth and dimension. He’d be the spy who keeps cooler than James Bond. Na Zdorovie! Nevertheless, there are a quite a few blights. As a whole, Spielberg’s film is very low-key and slow-moving, to the point of dragging. It takes an hour to get to the point where the official one sentence synopsis ends and another hour and twelve to finish the movie. I can appreciate building tension and setting the stage for different forms of big action set pieces (like Donovan’s shenanigan-laden meetings in East Berlin, getting mugged by a pack of East Berlin’s youths, and the climax), but this goes beyond just that. Spielberg does take great pains in crafting a small handful of memorable shots (take note whenever Donovan is on a train) – only that imagery will fade from memory rather than haunt you. The Coen Brothers’ voices also sound dampened. We hear them in the humorous asides, but they’re not as bold as usual. Altogether, this feels like a promise that doesn’t quite reach the payoff. 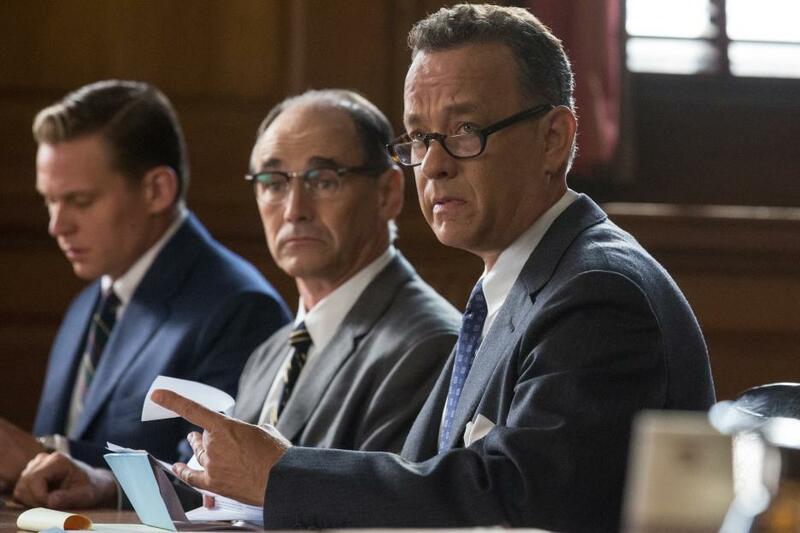 BRIDGE OF SPIES opens nationwide on Friday.